We just got word that our olive oil is in. To back up a little in the story, we’ve been peeling back the layers of our cheese production, and attempting to source everything locally. The two especially difficult products to source have been olive oil (no olives in Maine, and not a lot of domestic olive oil) and interestingly, peeled garlic. A happy meeting at a cheese class last year resulted in the discovery that one of our local caterers, a long-time friend and supporter of AC, Swan’s Way, imports her olive oil from friends in Italy. A couple of emails later, and we were in business! This year we doubled our order, and are eagerly anticipating our delivery of olive oil with a Story! Stacey writes: “Lily Zanetti has been a friend of my family for 45 years. She began bottling her own olive oil about 17 years ago, made from the olives of 100 year-old trees on her property. Originally, she had the oil, which is processed in Lucignano, made for the enjoyment of her family and friends. But as she started getting more requests for the extra virgin olive oil, her oldest son Alex began to increase production and bottle the oil under the Villa la Piertraia label (Zanetti’s family villa in Lucignano). The villas and olive groves are situated on Zanetti’s family estate, just outside the 12th century town of Lucignano. Best known for its churches, art and Thursday food market, Lucignano is home to just 2,000 people. Located in Valdichiana region of Tuscany, Lucignano is nestled in rolling hills and is surrounded by vineyards and olive groves. Less than a half hour from the better-known towns of Siena, Arezzo and Montepulciano, Lucignano is a medieval walled city laid out in concentric rings radiating from the town square — the only town in Italy laid out in such a way. I get a shipment once a year. I use the cans, with a milder but still fruity ﬂavor, for all our basic cooking and some of our dressings. 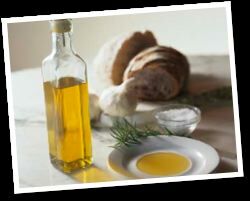 I use her bottled oil , which has a stronger ﬂavor, for the oil I serve on the tables and certain other dressings that like having the olive oil have a dominant presence. And I use the oil pressed directly from the olives in her front yard for the ﬁnal ﬁnish on certain dishes. It has an intense fruit ﬂavor with a strong bitter olive ﬁnish. Garlic remains another challenge. Apparently all the food service peeled garlic in this country is from China! How odd is that? Even the bulk garlic at the grocery store (if I had time to peel it) is from China. It comes with quaint brand names, like Hometown Garlic, but still…! This time of year, we go through probably 10 pounds of peeled garlic a week — not sure what that translates into for unpeeled garlic, but it’s a boatload. Sure would like to find local garlic. Hate the idea of lead in my cheese..
One of the reasons that I raise Alpines is that they come in a variety of colors and patterns. I would get so tired of looking at goats that all look the same. Every year I hope to get spots and stripes and bands, and am disappointed when I don’t. Any goat that is born on my farm with spots or splashes has a guaranteed place on my farm. Forever. Even if she is fat and non-productive. 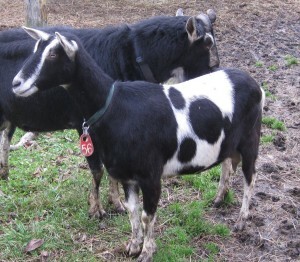 I yearn for the goat with the Mickey Mouse pattern on her side. I pray for a Virgin Mary image. A map of Maine would do. 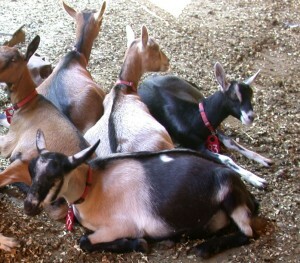 I am constantly tempted to add Nubians to my herd. Not so much for the butterfat, and certainly not for their hideous voices or frost-bite prone ears, but for the possibility of spots and frosting and new colors. I need to be able to look out the window and see a canvas of patterns in the herd. Last year we added a Nubian buck. Of course we claimed it was for the butterfat his daughters would add to the milk. Secretly, though, I was hoping for those spots. His kids turned out to be oh, so cute, and oh, so marketable. Of course, those kids went first, and we’re left with monochromia (if that’s a word). 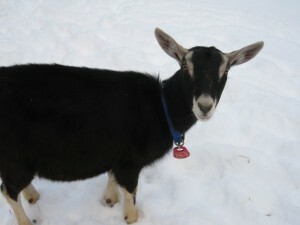 So, this year, we’re adding a Saanen buck. Perhaps next season we’ll have little white babies running around. With spots or an image of Jesus. But our farm is still not open to the public, so the faithful need not stop by to check. I have no idea why we named her Little Pea, other than she was only 4 lb. when she was born. Smaller than a peapod or a peanut? She was so little, I bought a special bottle for her. And of course she was spoiled rotten. 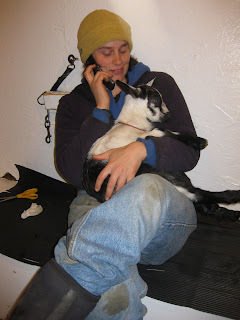 She became our farmers’ market mascot, riding in the truck on Claire’s lap. Customers adored her. We lost Little Pea last week — the saddest loss this year. She struggled so hard to deliver her first kid, and we tried hard to help her. We took her to the vet, a caesarian was indicated, against my better judgement, and she didn’t make it. She never got very big, and her kid was 10 -1/2 lb. Way too big for that little body to deliver. I’m so sad. All the yearlings miss her. Another disturbance in the force.